When Charles Koch founded the Cato Institute in 1974, his mission (in words from Cato’s journal) was “protecting capitalism from government.” That meant the end of public education, Social Security, Medicare, Medicaid, the Environmental Protection Agency, as well as cutting taxes on the rich and government regulations on business. It was a tall order—but now, for the first time in 44 years, Koch and his billionaire libertarian friends [now rivals] Robert Mercer and Peter Thiel are within sight of their goal of building a true oligarchy (Aristotle’s “rule by the rich”). The current Trump tax cut will deliver billions of dollars into the pockets of the Kochs, the Mercers, the Trumps, and their heirs. Creating a political economy in which the wealthy minority rule over the middle and lower class majority is a hard task. It requires mechanisms that suppress voting and mechanisms for propaganda that convince middle class voters that cultural divisions are more important than economic equality. In both these tasks, Google and Facebook have been a key to the success of the 1 percent. The role of the internet in propaganda and voter suppression is a two-pronged attack. Aldous Huxley’s Brave New World foresaw our current dilemma—Huxley’s assertion was that technology would lead to passivity. The ease with which we could consume mind-numbing entertainment and distractions would ultimately rot our democracy [as bread and circuses did to the Roman Empire]. And this is exactly what may be happening. In the 2016 presidential election, 94 million citizens who were eligible to vote declined to exercise that privilege (compared to the 136 million who voted), according to the United States Election Project. And a much larger percentage of millennials are nonvoters. As Kevin Drum reported in Mother Jones, “In 1967 there was very little difference between the youngest and oldest voters. By 1987 a gap had opened up, and by 2014 that gap had become a chasm.” Beyond the extreme apathy, Republican legislatures in many states have instituted far more restrictive voter ID laws, which have also contributed to lower voting rates. But Steve Bannon wasn’t content to leave voter suppression to chance. One of his brilliant moves was to circulate memes on Facebook targeting only African American voters with the text: “Hillary Thinks African Americans are Super Predators.” By all accounts it was a successful voter suppression strategy. But it is the internet as a propaganda machine that really changed the game in 2016. The notion of right wing propaganda is not new. Rush Limbaugh’s rise paralleled that of Ronald Reagan’s. Fox News was launched in 1996 and was in enough markets by 2000 to help elect George W. Bush. But the use of social media as a propaganda organ is distinctly different from radio and TV. For one, our smartphones are with us every waking hour—we check our phones on average 150 times per day, and Facebook alone gets 54 minutes of our time per day. But as the experts of Cambridge Analytica, Robert Mercer’s data-mining firm, have explained, their ability to scrape your most intimate feelings about subjects like race or immigration from Facebook and then reflect them back to you in dark post ads—custom tailored to evoke an emotional response—is an unprecedented form of manipulation. 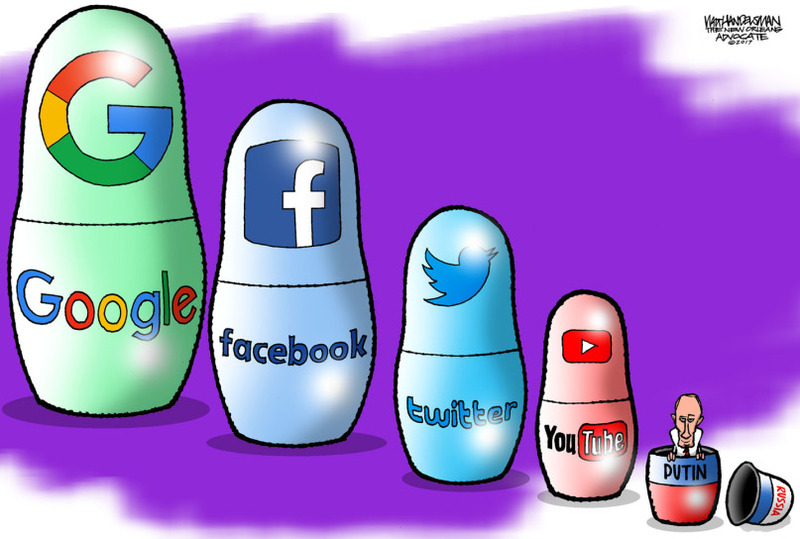 The current disclosures by Facebook and Twitter of Russian-financed propaganda on their platforms is but the tip of the iceberg. Facebook has revealed the purchase of $100,000 of advertising by a Russian group with ties to the Kremlin, and it shut down 30,000 fake accounts before the French election earlier this year. The tech behemoth needs to tell us the number of fake accounts in the U.S. they have shut down since the American election, and if any of those accounts purchased political ads. In addition Facebook needs to reveal the content of the millions of dollars worth of “dark post” ads purchased by the Trump campaign using Facebook’s and Cambridge Analytica’s micro targeting technology. Given that these were paid political advertisements, there is no privacy excuse Facebook can proffer for keeping these ads secret. We have been here before. But not since the days at the turn of the 20th century, when Teddy Roosevelt took on the monopolies of John D. Rockefeller and J.P. Morgan, has the country faced such concentration of wealth and power. Peter Orszag and Jason Furman, economic advisors to President Obama, have argued that the fortunes created by the digital revolution may have done more to increase economic inequality than almost any other factor. Men like Koch and Mercer and their paid politicians like Donald Trump, Paul Ryan, and Mike Pence are determined that “this time is different.” Over the last 40 years they have watched the gains for their cause of “economic liberty” under Reagan and George Bush be erased by the raised taxes and regulation under Bill Clinton and Barack Obama. They are determined to hold on to power for the next generation until there is no more government funding for education, no EPA, no Social Security, no Medicare, no unions. The sole purpose of government will be to pay for the police to guard their mansions from the inevitable civic unrest caused by their crusade. The congressional investigations into the social media platforms needs to be thorough and probing. New regulations to prevent propaganda manipulation, particularly by foreign countries who are our adversaries, are required. There is much more to what happened in 2016 than has yet to be reported. For so few new voices speaking out, their impact has been tremendous. It has elected Presidents, changed Congress, and established a large voting base for conservatives. So, was it the emergence of these players on the scene that created the conservative sweep of government, or was it an untapped constituency that finally found it’s voice that made it so? My opinion is that the voters were always there, but they needed to gain a foothold in the media to make their presence known. I agree. For the first time a person can obtain information they want without it being filtered through a liberal biased media. Of course, whether it is propaganda or valuable information depends entirely on you political perspective. I agree, again. However, the vast majority of these digital revolution are liberals. Since they amassed large fortunes that increased economic inequalities, and since they have done little to promote less income equality, why is it that liberals only blame the conservative wealthy for the problems associated with income inequality? After all, there more millionaires in the democrat party than the GOP. Hypocritical bias, perhaps? Talk about a dangerous concept! Who would decide what was propaganda and what was legitimate news? And what do you do when propaganda IS legitimate news? Giving the government censorship powers is NOT a good idea. this is not what people who voted for obama twice and voted for jill stein let alone donald trump made them not vote for hillary clinton in ohio pennsylvania michigan and wisconsin and almost minnesota. voters in these states michigan and wisconsin voter for sanders in the primary not clinton. the black community who carried states for hillary in the primaries were disgusted with her refusing to put a black man like cory booker on the ticket. they could see right thru her. 2018 is one year away and instead of addressing why a 1000 state legislators have lost to republicans since 2010 and both the house and the senate have republican majorities, you yell russian collusion and interference. who does this impress beside other elitist liberals like yourselves! go tell voters in michigan wisconsin pennsylvania and ohio it wasn’t your jobs going away but social media propaganda from russia that made you not vote democrat. see where that gets you. it was latinos voting against arpaio not liberal snowflakes who kept the race in arizona close. this is why the senate race was called early and the presidential race took days not russian influence.kavanagh is laughing at you. Of the $100,000 in Facebook ads, 56% were run after the election so only $44,000 worth could have influenced the vote. But much of that was spent in solid blue states. So about $20,000 in ads trumped three televised debates, two tel3vised conventions and $2.4 billion in campaign spending. NOT. What is your actual problem? You are defending a hostile foreign government attacking the US. You really should learn more about what is happening, because this column isn’t even 1% of what’s going on. What post did you read? Where did I defend any foreign government? You can’t just make things up. What post did you read? Where did I defend any foreign government? You can’t just make things up. Wait. You can because this is Blog for Arizona. Wait. You can make things up because this is Blog for Arizona. No, that would be our blog trolls. I read your post, sport. The one where you say a few ILLEGAL dollars of Russian money is nothing compared to 2.4 billion in LEGAL campaign money. The post where you compare illegal apples to legal oranges in an effort to downplay what Russia did. The post where you should have been acting like an American and demanding that Russia be held accountable for their actions. Ronald Reagan is spinning in his grave and you are not a Patriot. I hope you won’t take Tom too seriously when he throws words like “traitor”, “unpatriotic”, etc. He doesn’t really understand what the words mean and he thinks they only apply to non-liberals. If you disagree with him, you are automatically branded as a traitor. He tries very hard to make the attack personal, but the truth is he uses the words with anyone with whom he disagrees. What do you recommend we do? Good question. I’ve given this some thought. Communication, of course, requires a sender and a receiver. If you are the receiver, that is where you have control, and that is where most of us are in social media. Most of us do not have the ability to communicate our own ideas, information, propaganda, etc… with thousands or even hundreds of people every day. Most of us are on the receiving end of this rapid dissemination of information, good or bad. So it would seem the first line of defense would be to manage our social media accounts. Many people are already doing this to some degree because of growing concerns about exposure to identity theft and other crimes. This same mindset, the need to protect one’s identity, can be extended to the need to protect oneself from being misled by propaganda. Many people do this already, of course, almost instinctively. But we need to develop this and make it something we can teach others especially children and young adults. I’ll add to this later. Most of my experience is with Twitter and Facebook. And I much prefer Twitter. Twitter is simple and straightforward and everyone is on Twitter. Essentially, you have to work on your feed to get the most out of it in the least amount of time expended. I follow about 50 people on Twitter and I regularly go through them to keep that number around 50. It may not seem so at times, but there are still a lot of good journalists out there and some good politicians as well as other interesting people. So let them do the work, they have staff and you don’t. Follow only the good ones that you like. They will tweet and retweet good information and links. Some of these folks use social media very seriously, Bernie Sanders is a good example. Over time, you know who they are , so keep trading up. I’m almost read only on Twitter, I seldom tweet, and that keeps it simple. As for Facebook, it’s more difficult to manage and is not, in my opinion, as good an information resource as Twitter. That’s because people have “friends”, they “like” pages, they join groups, etc…and their feeds are full of crap. “Unfriending” someone is beyond horrible, so you avoid doing that if it’s someone you actually know. But you can “unfollow” a “friend” and you won’t see their posts anymore. It’s a much easier decision to “unfollow” (unlike/leave) pages and groups. And you can prioritize what you see in your feed. Click on the three dots to the right of “News Feed” (left side of your home page), then click “Edit Preferences” to clean up your FB mess. Briefly, in social media, if something looks bad, get rid of it. A better way to say that might be that if something looks bad (like propaganda), is not interesting, or has become useless, get rid of it.